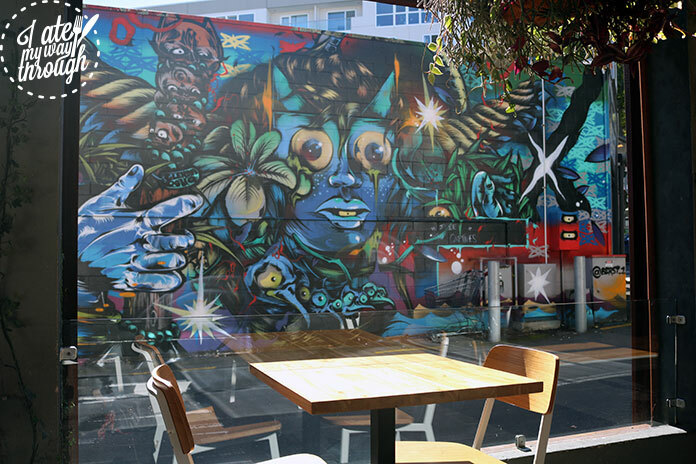 Tucked away on a bright corner along the shopping strip in Newmarket, Auckland is Cali All Day Eatery. A popular little joint with locals and visitors alike, it’s a great place to take a break from a shopping spree, relax with a coffee or just enjoy some great food any time of day. Taking a seat on the sunny side peering out onto the graffiti wall across the way, it’s easy to see why this hip little eatery is so popular. I kept seeing the Blueberry and Watermelon Fresca (NZD $6.50/AUD $5.99) being brought to customer after customer, so I had to see why it was so good. Turns out, it’s a delightful mix of fresh fruit pureed and topped with soda, then garnished with fresh watermelon. It was a lovely refreshing drink which really cooled you down after being warmed up from the sunlight streaming through the windows. 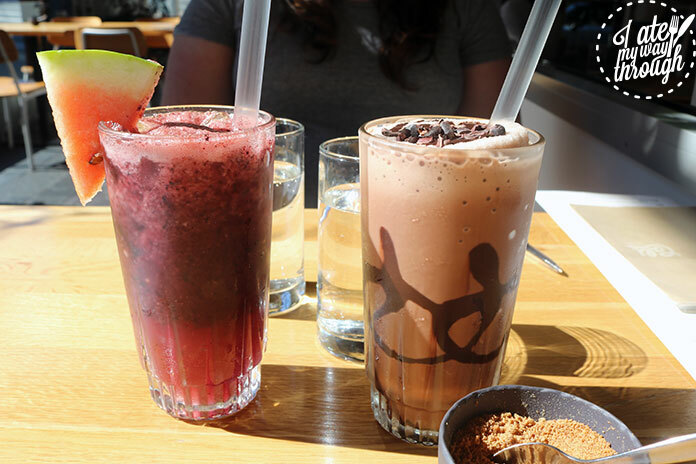 The Iced Chocolate (NZD $8.50/AUD $7.85) was a classic style iced chocolate, blended with ice and topped with shavings of cacao. It was a very rich chocolate flavour, but extremely moreish and a great way to whet your appetite. In a great touch of customer service, head chef Eric and manager Pablo came out to check on us and to see how the meals were, but they need not fret as everything was wonderful! 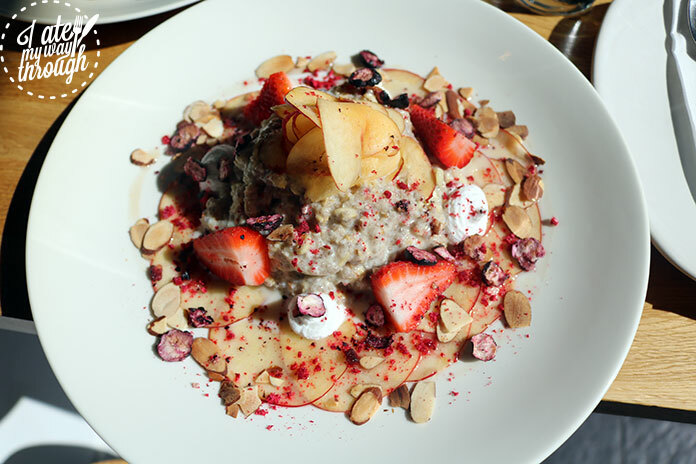 The Chia Seed Bircher (NZD $14/AUD $12.90) is made with organic chia seeds, oats, ground almond, coconut, apple, coconut yogurt, maple and seasonal fruits. This dish is dairy free, yet still still had a lovely creamy texture from the bircher mix and coconut yogurt. It was beautiful plated on a bed a thinly sliced nectarine and apple, freeze dried blueberries and fresh strawberry which were the flavours of the day. One of the great things about Cali is that they use the fresh ingredients that are available daily so the dishes are always dynamic and changing from day to day. I had previously seen the French toast (NZD $18/AUD $16.60) by Cali on Instagram and knew that it was going got be an unmissable dish. The thick, muffin-style brioche, compressed strawberries, marscapone, seed crisp and maple is a stunning dish with some beautiful flavours. One of the interesting components of the dish were the compressed strawberries that are muddled with sugar and citric acid then left to soak. The seed crisp was also ingenious, something I had never seen with french toast, but introduced a great nutty snap into the mix. 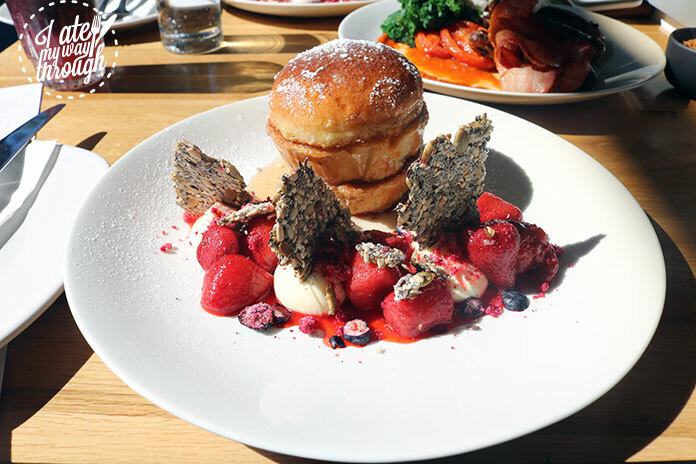 Everyone loves a big breakfast (NZD $24/AUD $22.15) and the one at Cali is the perfect way to kick off your day. 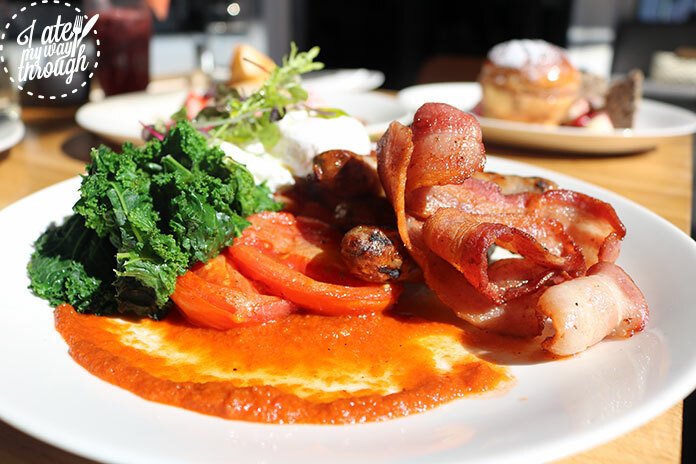 Two eggs served to your preference, on Danish rye, spelt or gluten free toast, pork and granny smith sausage, streaky bacon, confit tomato, braised kale, beauregard kumara roost with salsa roja. The sausage was one of the best aspects of the dish, with the granny smith apple cutting through the usual fattiness of a pork sausage and giving it a slight sweetness. Another great bite was the kale, which was interestingly braised with soy sauce. I loved the kumara rosti, as kumara is native vegetable and such an integral ingredient in New Zealand cuisine. Cali was a great spot to stop on my recent trip to Auckland, with a convenient central location it was a wonderful place to soak up the morning sun and tuck into a hearty breakfast before a day of exploring. 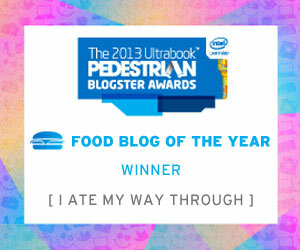 I only wish I’d had time to stop to try the lunch menu!